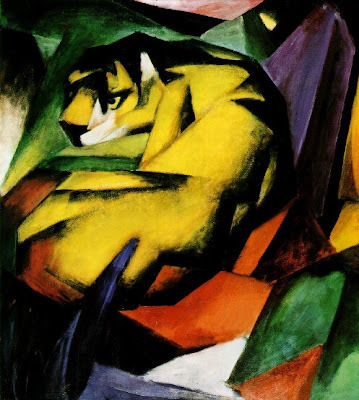 Born on this day, 8 February, in 1880: German expressionist painter and printmaker, Franz Marc, best known for his colourful paintings of animals His life was cut short by World War I. He had volunteered in 1914, and was killed, aged 36, during the invasion of Verdun in March 1916. 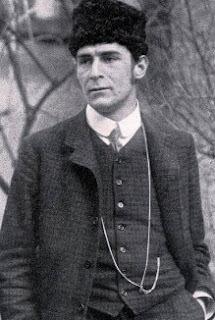 His closest friend, another German artist, August Macke, had been killed within weeks of war's outbreak, aged 27. 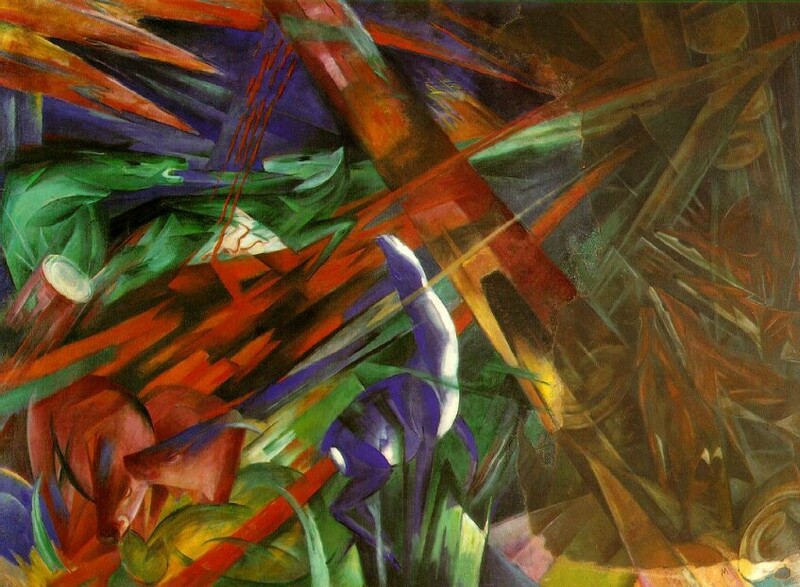 Franz Marc set out initially to pursue a career in the church, his pull towards art was discouraged by his artist father who considered his son lacked talent, resulting in Franz experiencing feelings of worthlessness and periods of depression. In 1905, Marc spent the summer walking the Bavarian Alps where he first became interested in representing animals within their natural surroundings. In 1907, he married a friend to legitimize her child conceived with another man. On his wedding night, he suffered a nervous breakdown and fled to Paris. In Paris, he found peace in the late works of Van Gogh and Gauguin. In September of that year, he returned to Nature at Swinemunde where he began to truly understand the joyous meaning of organic unity and harmony that exists among all living things. Once he felt this connection, his life changed. He returned home to Munich via Berlin where he visited the zoo every day for several weeks. From 1907-10, he taught lessons on animal anatomy in his studio. In 1908 he divorced his first wife and in 1911 he married his second wife, Maria Franck, who was a drawing teacher from Berlin. 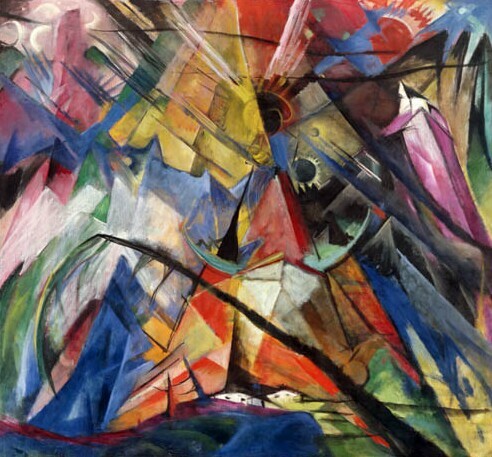 In 1909 he....came into contact with Wassily Kandinsky who would become a mentor. The two split from this group and founded Der Blaue Reiter (The Blue Rider). In 1910, he met his closest friend, August Macke. 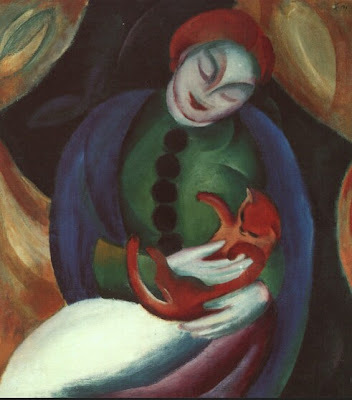 Macke introduced Marc to the important collector Bernhard Koehler who would support Marc throughout his career. In 1910, Marc had his first one man exhibition in Munich....... 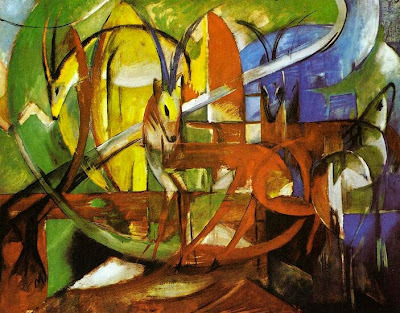 In April 1912, after seeing the Futurist exhibition in Berlin, Marc began to experience feelings of an impending Apocalypse. It was said that Marc possessed a sensitivity bordering on clairvoyance. Marc is particularly loved for his animal subjects including horses, deer and dogs. 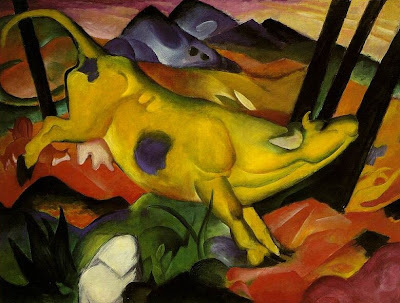 He attempted to spiritualize German art by shifting its focus from the external towards the soul of the individual artist and his connection to the natural world. 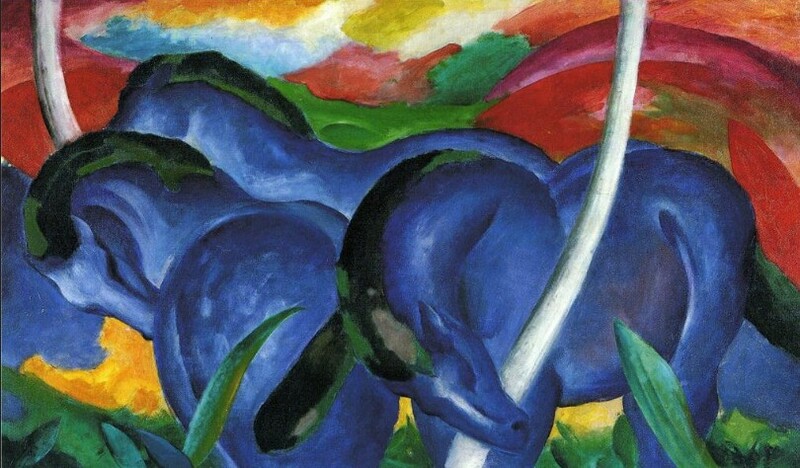 Franz Marc is perhaps best known for his paintings because he produced only 46 prints. In the spring of 1914 Franz and Maria Marc bought a small country house in Ried. According to Kandinsky, this purchase was one of "Marc's greatest wishes come true." He was even able to keep a dog and a tame deer there. But in August of 1914, at the outbreak of the war, Marc volunteered. Kandinsky visited him to say "Auf Wiedersehen." but Marc replied "Adieu." Within two months, Marc's first personal indication of the war's magnitude occurred; August Macke died in battle in September at the age of twenty-seven. Marc wrote and drew extensively at the front. His drawings show a remarkable looseness and facility, for the most part combining figurative elements within a Cubist of Futurist framework of lines. Frequently still, innocent animals are depicted, yet now within a gradually tightening web of force lines that are reminiscent of Marc's vision of destruction, Fate of the Animals, 1913. "I understand well that you speak as easily of death as of something which doesn't frighten you. I feel precisely the same. 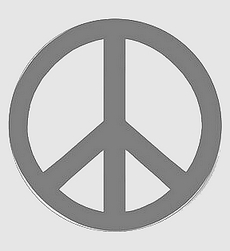 In this war, you can try it out on yourself - an opportunity life seldom offers one...nothing is more calming than the prospect of the peace of death...the one thing common to all. 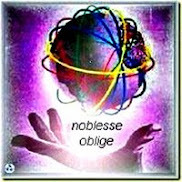 It leads us back into normal "being". The space between birth and death is an exception, in which there is much to fear and suffer. The only true, constant, philosophical comfort is the awareness that this exceptional condition will pass and that "I-conciousness" which is always restless, always piquant, in all seriousness inaccessible, will again sink back into its wonderful peace before birth... whoever strives fro purity and knowledge, to him death always comes as a savior." There's a predominance of Earth signs here. Earthy Venus-ruled Taurus is on the acendant, creative Neptune is nearby; and there is a Grand Trine in Earth; natal Moon is Earthy too - in Capricorn. The Grand Trine is made up of Venus (planet of the arts), Neptune (creativity and imagination) and Uranus (the avant garde). Marc's Earthiness clearly translates through his artwork via his concentration on animal subjects. 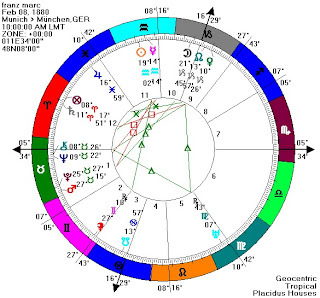 In first house, Pluto at 25 Taurus is conjunct Fixed Star Algol, and Mars. 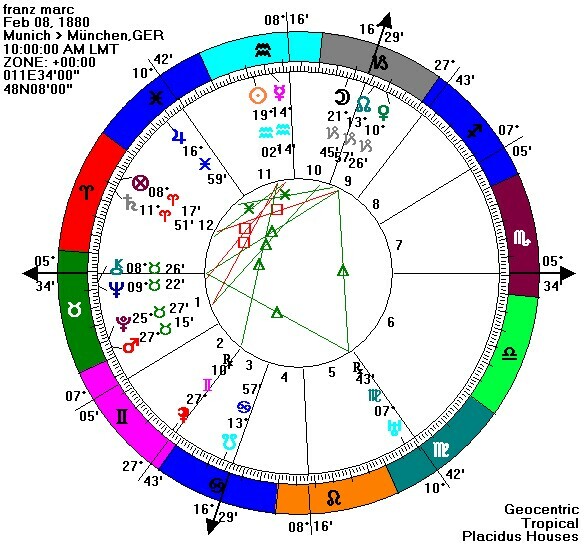 This is a natal chart where Algol's allegedly unfortunate "influence" manifests (it doesn't in every case) : Franz Marc's death in war. I haven't mentioned Sun and Mercury in Aquarius yet - they are semi-sextile Jupiter in sensitive, intuitive Pisces - reflection of his "sensitivity bordering on clairvoyance" mentioned in one of the quotes, above, and of his philosophical outlook. hmm you sure are having a lot of drive by's lately Twilight:) all these anonymous comments must be annoying . anyway, all morning and some of yesterday too I have been reading at sites about life after death, so to see the portion of Franz writings you choose stunned me and made me smile. 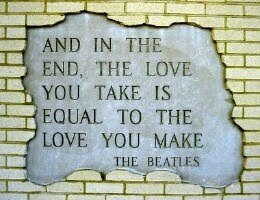 seems like just one more proof positive that things are just as they should be and that if I seek, I will find.. I looked around around on your blog and couldnt find a contact area- email I mean. so I'll just ask you to email me if your willing to. 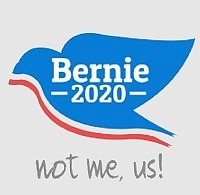 thanks in advance and if you'd rather not- thats ok too. Enjoyed your discourse on Franz Marc, Twilight. He sounds like a sweet guy! I lost track of a fellow that I knew years ago that had astrological similarities...Earth trines...he, too, had an unusual, uncanny regard for nature and particularly animals. He spoke their language! Marc's natal chart has interesting placements...certainly a sensitive, intuitive individual. Always sad to lose (from our perspective here on Earth) a talented, spiritual contributor to our species. That time period was unique for the avant garde and advancement of knowledge in many fields. The impressionists laid a foundation in the preceding decades, opening the abstract gates. At a time when landscape and portrait paintings were considered de rigueur, modern artists of that period suffered tremendous public criticism and humiliation. Thankfully, they clustered amongst themselves for support and carried-on, leaving a legacy. Most had no benefactors and died poor, only to have their works fetch astounding dollars decades after their deaths. I'm pleased my post fitted in with your reading today. I will drop an e-mail your way shortly, Sonny. I don't carry mine on the blog - wary of even more spam potential! 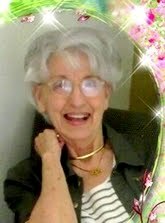 mike ~~ He does seem to have been a lovely person, it's very sad he was lost so soon and in such dreadful circumstances. 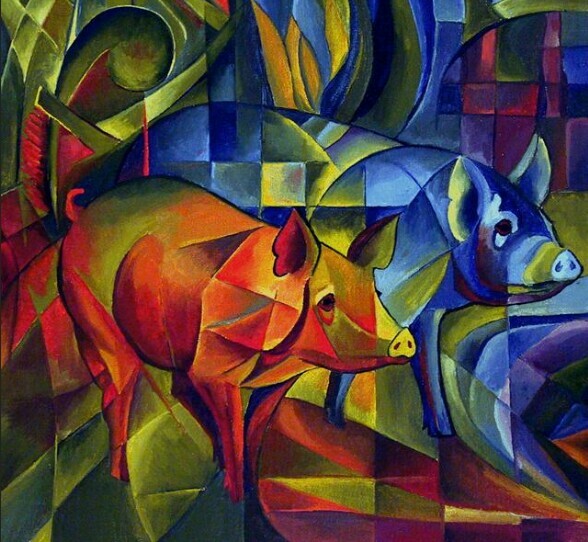 I like his paintings, they kind of bridge realism, cubism, abstract, and impressionism. Subject matter and context is still easily identifiable to the viewer. I usually prefer more subtle colours, but could live with these, as being symbolic. Yes, lots of great new stuff was unfolding in the first decade or so of the 20th century - until the intervention of World WarI. "History, that excitable and unreliable old lady"
Of Fishes, Fascists and Forbidden Fotos. Exceptionally Exceptional in its Exceptionalism? MOTE, meet BEAM; BEAM, meet MOTE! Hidden Wrongs and "The Essential American Soul"? Drones: "most brutal weapons of all"